So let's talk about that opportunity. How will you take advantage of that from a strategic perspective? I've seen your advertising saying don't let your business be put on pause by Dell/EMC. What are you telling those customers and how will you capture the hearts and minds of those Dell/EMC customers? There's really a two-prong approach there. One is to make sure that all the Dell/EMC VARs know that they are most welcome at Hewlett-Packard, so we are reaching out to Dell/EMC VARs who are nervous, because VARs make their living with these companies. I know this personally, because when I got here all of our VARs were nervous. So I recognize nervous VARs. We're talking about our roadmap for innovation, our ability to sell with them, our ability to hunt new accounts for them. And this was the play we ran in many ways when IBM sold their server business to Lenovo. We're actually doing that exact same play, which was very successful for us. And then for direct customers, we really talk to them a lot about what our capabilities are from a service perspective, from a software perspective and from an infrastructure perspective. One of the interesting things about the Aruba acquisition was we are now introduced to a lot of installed base of other companies, whether it be Cisco or Dell, because Aruba had a very long-term partnership with Dell. When I was at the Aruba Atmosphere Event, which is their big customer event, I probably met with 10 to 15 customers, virtually all of which were Dell shops, because they had a long-term partnership with Dell. In a funny kind of way, we have a lovely introduction to the installed base of some of our competitors, and we have to earn our way in. I always say: "Let's do one or two things really well for you. You'll get to know Hewlett Packard Enterprise, you'll get to know our capabilities. And you can decide what you'd like to do with us next." If I'm a smart Dell/EMC customer, what should I be pressing HP Enterprise for now? What can I get out of you? First of all, from a storage perspective, our all-flash portfolio represents an incredible growth engine for us and real differentiated functionality for our customers. We're the fastest growing vendor in the all-flash array [market]. We're growing three times the market rate. Our vision is to accelerate the journey to the all-flash data center and enable a single, unified data fabric that links servers, storage systems and integrated appliances. That's the real point of difference and people are pretty excited about it, and the numbers bear it out. No one grows three times the market if they don't have a differentiated offering. The other thing that they should talk to us about is Composable Infrastructure, and this is what we call Synergy, and it really brings together compute, storage, networking fabric through a single interface that's powered [by] HP OneView. It composes physical and virtual resources into a configuration that is unique to an application. So it's a great developer tool. You can compose your infrastructure, get it running in production, and then it automatically releases compute, storage and network capability back into the pool if that application no longer needs it. This is very forward-looking new stuff that results in lower cost and more agility for the developers. I think our line of servers is the best in the world. You just look at our Gen9 server; we're sharing many more three-year product roadmaps with our customers -- and the server roadmap is second to none. It is remarkable what we are doing there. HP Apollo, our high-performance compute, is remarkable. And then they should look to us for cloud. We are number one now in private Cloud. Private Cloud is the easy way to get started as you want to cloudify your environment, because private Cloud is on-prem, it gives you a 10 per cent to 30 per cent cost advantage versus a traditional datacentre environment, but you have control. It's a great way for customers to begin this journey to cloud. And then if you think about our Cloud system automation tools to orchestrate in a multi-cloud environment, people should look to us for that. Here's one of the things that is different than what I thought it was going to be. I thought most companies would pick a cloud provider -- [Microsoft] Azure, [VMware] vCloud, Helion, whatever it happened to be -- and they would basically move whatever applications they were going to move to the Cloud, they would move to that cloud provider. That's not what we see out there. People are running multiple instances of Cloud, whether it's AWS or Azure or Helion or vCloud, and so they've got a multi-cloud environment orchestration and automation challenge that I think we're uniquely suited to help them with. Those would be top of my list of things. I would probably also say Edgeline, which is our new line of servers that is designed to be at the edge. I think it's going to play a real role in IoT, because remember in IoT compute has to be at the edge. It was interesting, I was in an autonomous driving car in Berlin about two months ago. Have you ever been in an autonomous car? No. How fearful were you in that situation? This was sort of frightening, honestly. We had a driver, but he was not driving. The car was driving itself. And it brought home this compute at the edge for me, because think about it. You're driving along in the car and the sensors in the car, 360 degrees, are inputting data instantaneously. Okay, so is that traffic sign a person or is it a fixed object? As the car is changing lanes, is the car in front speeding up or slowing down? So the data input is huge, and it has to be processed in real time. If you open up the back of one of these driverless cars, basically what they have in the trunk is a baby data center that is processing all this data in real time. It brought home to me that what we have to do on the edge is we've got to have little baby Composable Infrastructure effectively that can combine server, storage, networking in a converged infrastructure. I think that's a super-exciting opportunity for us and I think we're leading in that. I mean these are little components. This Edgeline server, we should like take a picture of one and send it to you. I mean it would fit in the trunk of a car. So whether it's in an airplane or in a medical institution or whatever happens, to me these Edgeline servers, I think, are pretty cool. We talked about Dell/EMC, but let's look at another competitor, Cisco, for this next generation of infrastructure. Clearly strong in networking, strong in at least a portion of the server market, they have partnerships in storage and could make a bigger play there. They have all the elements. How do you view them as a competitor in that emerging IT architecture? Obviously their core strength is datacentres, switch and networking. And they've done a remarkable job over many years. What we see is there is an opportunity for us in the campus, branch and edge, because most CIOs want an alternative to Cisco. They would like to test out our networking operations in what they perceive to be a lower-risk environment, which is their campus, branch and edge, which I totally get. Right? If your campus goes down, it's okay. 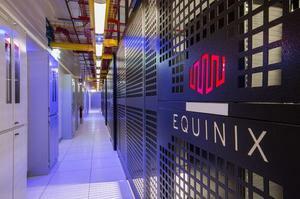 If your data center goes down, it's not okay. But they get to know our data center switching and they get to know our data center capability via the Aruba acquisition, and that is actually working really well. What I say to customers is, "Listen, you need to inject competition into that market, you need to see what the latest and greatest capability is there, because you do not want to have vendor lock-in as you try to reduce your costs and improve your agility over the next number of years." So I think we've got a real opening there. We're really the second largest, now, networking company in the world, at the tipping point I think -- certainly at campus, branch and edge, and perhaps even in the data center. 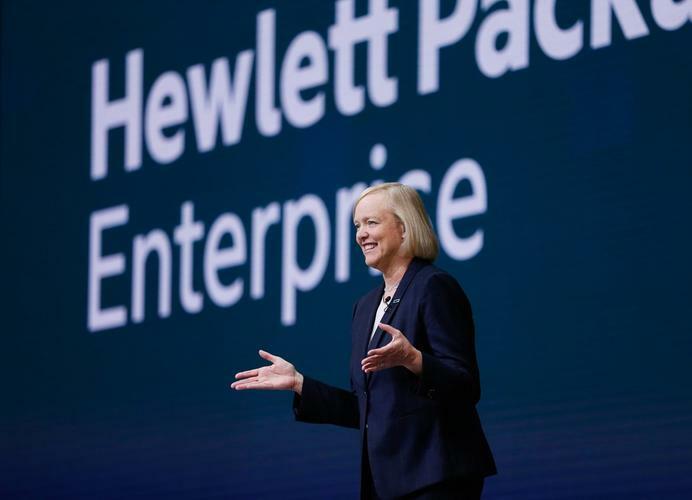 From a converged infrastructure perspective, I think our HPE Synergy will now launch us ahead of Cisco, and so we've got to go earn that business back. We're the only company with server, storage and networking under one roof, so we don't have to rely on partnerships, although we do have reference architectures, as you know. So we feel pretty well-positioned there. But they're a very strong competitor and we've just got to keep innovating and keep doing things that make customers' lives cheaper, better and faster. So I want to ask about private Cloud in terms of how long is this a stopgap? Do you see this as an ongoing market or how long is it before people move significantly more of their applications and workload to the public cloud? So this is the million-dollar question, right? It is a big disruption in the industry and the question, to your point, is: Which workloads move on what kind of timeframe and where do they move to? Do they move to the public cloud? Do they move to a virtual or a managed private cloud? Do they move to a private cloud on-prem? And the way you have to look at this, in my view, is application by application and workload by workload. Because there are some workloads that I think will move quite quickly all the way perhaps to a public cloud: Web applications -- customer-facing Web applications that are not mission-critical applications to an enterprise. There are some applications that frankly will never move. There are applications that are running on mainframes, as you well know, and I don't think they're ever moving anywhere. I mean I'm not quite sure what's going to happen, but a lot of these core banking applications I don't think are ever moving because the cost to move them is too high. So I think it's a continuum. And it also depends on the industry that you are in. If you are in a customer-facing industry that is lightly regulated, my view is you may move applications faster. If you're in a highly regulated industry, either from a compliance perspective or a data perspective, you will move more slowly. There's no question that this is a trend and we're trying to make sure that we can help customers do what is right for them and for their environment. Hence our partnership with Azure. Customers that want to move some applications to a public cloud, we're not in that business anymore and we have a deep and tight partnership with Microsoft and our view is that you should move to Azure.